Anything I have that could be construed as a blessing from God, is not from any local 501(c)(3)church that I attended. My ability to earn wealth came from the degrees I earned from the University of Florida. They also are a non-profit that raises millions of funds. Yet they never threaten me with words like "curses", or saying I am not a Christian, or telling me "you would not have that job if it were not for us" or "this is where you went to school, you owe us support." No, they simply inform me of all the good they are doing and the needs they have, and I respond out of gratitude and understanding and logic and reason. They raise billions doing it this honest and upfront way! Think about it! Who do you call when you are sick? Your doctor? Who do call when your power gets turned off? JEA. Where do you go when you need money for food, clothing and shelter? Your job. No wonder Christians are viewed as non-thinking, illogical, gullible human beings. This guy needs to team up with Mike Murdock and then they could team up together on a "Campmeeting"show. I was very sad to see some of the recent guests at lifechurch (Young, Morris, Noble). Over all, I've been pretty impressed with how they handle things (Starting YouVersion, Giving away resources instead of selling them to enrich the pastor, etc), but anyone inviting Morris to their church to speak knows exactly what they are doing. Does anyone else think he looks like "The Churchlady" from the old SNL skits? Both funny, both slightly weird, and both FAKE! In Matthew 15, Jesus had some choice words for those who would give the money to the church when in reality they should have been taking care of their family. Robert Morris is encouraging korban. He seems to be preaching a message that doesn't match up with what the Bible teaches in the OT law: (3 tithes always food), NT (grace giving) and is the opposite of what Christ taught to the Pharisees. He only gets away with it because the church is Biblically illiterate. ""...Hear Me now, all peoples who call of themselves by My own name, by the name I have given My Son: No prophet of The Lord shall, by any means, receive payment for his services; nor shall he accept a gift or profit from My Word. Nor shall he allow praise or glory of any kind, offered on his account, to stand; rather he shall rebuke them sharply. I am The Lord... For as he has freely received, so shall he freely give...""
""...""...Oh churches of arrogance, how shall I gather you, when you resist all correction and follow after the vain babblings of men in authority?... Heaping to yourselves teachers, wolves in sheep’s clothing, saying that the Word of God is the way into riches and material things...""
God gets first in everything. It's not that hard to comprehend nor do you have to look hard through Scripture to find the principle. People who fight against tithing are people who typically don't biblically tithe. This is straight foolishness. The sad thing is people are not reading their bibles for themselves. I know because I was one who believed everything a pastor/leadership said. Thank God my eyes are open to this heresy teaching another gospel. Amen to Watchdog's advise and Scriptural grounding. ﻿'...evil people and impostors will go on from bad to worse, deceiving and ﻿being deceived'(2 Ti 3:13). The comments on this page are extremely disappointing. 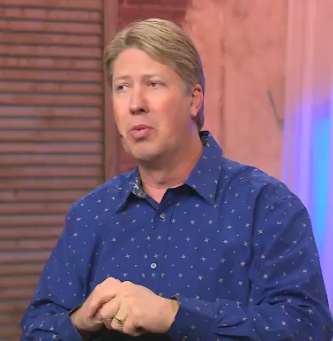 Robert Morris is one of the best preachers I have ever encountered and teaches as the bible says. His unwillingness to compromise in the Lord's Word is what has allowed him to build one of the most solid church ministries in the world. It is amazing to me that other "Christians" would spend there time trying to tear down a man who has devoted his life to bring people to the Lord. I wish you all well, but I will be praying for Robert Morris and his continued success of reaching the unsaved masses. I will be praying that he pushes through these attacks. Now there's an oxymoron if I've ever read one. "Robert Morris is one of the best preachers I have ever encountered and teaches as the bible says." Really he teaches grace giving as the Bible says in II Cor 9:7? Why does he neglect the other 2 tithes in the OT (as the Bible says)? "His unwillingness to compromise in the Lord's Word is what has allowed him to build one of the most solid church ministries in the world." So what allowed other religions to build worldwide ministries? "It is amazing to me that other "Christians" would spend there time trying to tear down a man who has devoted his life to bring people to the Lord." Take a look at Acts 17:11 - now that's amazing! "I will be praying that he pushes through these attacks." I'll be praying for those that are harmed by his false doctrine. Anonymous 7:14. I couldn't agree with your statement more. As a LifeChurch attender, I have been very concerned with who has been invited to speak. Concerned that Furtick, Morris, Young and MacDonald have spoken. I wish Craig would disassociate with all of these megas. I was always taught you are judged by the company you keep. I listened to all the messages in this series, and thought Craig had a great message that didn't embrace Morris' principals. One correction I would like to make, this was a 3 part series and it is NOT the beginning of a campaign. LifeChurch has never had a campaign since I have been there. They operate with a large margin in the budget and pay cash for every new building. There are multiple campus' being built currently. You are so smart and self sustaining. You are awesome. ....good for you oh wise one. Many will willingly follow these men and defend them at all costs.Just like Anon @3:34 PM. I believe that those who willingly continually follow these type of men, after knowing the truth about them, are non-believers.The Bible clearly speaks about the wheat and the tares. It is interesting that you never hear preaching about the tares in church. Most people want to believe that everyone who goes to "church" is a believer.When in fact, that's not what scripture says. To the First anonymous: God bless you and God bless Pastor Robert Morris. To the second anonymous, I pray the holy spirit reveals himself to you. Think of all the death and destruction that could have been avoided in the Bible if people had only tithed. Oh wait, lots of them did. Especially the Jews. It's not magic dust, all ye who preach - and hear - as such. Everybody should burn this cd and give a copy to every Christian that you know. Also email the link to everyone that you know. I am guessing no one will respond, but I would be curious to hear Morris' supporters explain to me, as a Christian, what he means by our money being "cursed". If you ascribe to the belief that all gifts come from God, how can our income be "cursed?" Also, what about Matthew 22:21? I think LifeChurch does amazing work and has done what many churches have not: maintain financial integrity. However, this current series, "Multiply" is very concerning. It seems out of place. Especially when you consider how LifeChurch hires staff. They seem to have an attitude that during the first year staff should be under compensated to "suffer". A friend of mine was offered a position and it was extremely low, even for a ministry position. He really had no choice with family commitments, but to decline. And thus you make his point/argument valid. Instead of being taught to scripturally try to reach this person to Christ you sit with huge saucer shaped eyes and gaping mouth listening to "pastors" tickle your ears while you ring the moneyplate. Your response is weak, pointless, childish, and shows what lack of teaching you are recieving! At least he boldly and confidently stands for or vs something! How about you? Or just pithy little sayings? What is so troubling about this "message" by Mr. Morris is that some christians really believe him. I use to be one of them, but not anymore. It is a hurtful thing to be misled; however, there is hope in Jesus Christ for people who are being led astray. Thank God there is hope. I will continue to pray for God's people to come out of those churches who misrepresent God and Jesus Christ the Lord. Why do they listen, some have asked here. Well, by gosh and by golly. Aside from Mr. Morris, didn't you all know Kari Jobe, another New World Order darling, is the starlet of this church? People listen because they think they are on the same "team" as these pastors and musical starlets. They are there as distractions, barriers to keep people from seeing what is happening in the real world. Corruption is allowed to grow when it's hidden. Our nation is in the state its in ... economically, morally and everything else, because none of the churches dare speak out, lest they lose their tax-free status'. We don't REALLY think they're going to give up all that tax-free income, do we? Ha! Not only are churches bilking and lying to their congregations they are in bed with the government and a system destroying our nation. Gimme money or God will curse you. Or it is Witchcraft? Putting a Hex on you if you don't gimme sounds more like a Manly Wade Wellman villain. Anyone got a silver-strung guitar and copy of The Long-Lost Friend handy to go up against Conjure-man Morris? I'm a little late posting here, but I have a thought that's been bothering me for a while: How many of the religion-as-a-business clergy are actually atheists? Some of the shenanigans make me wonder if some of these folks don't even believe in God at all. Have you read the first 5 chapters of the book of Acts? It goes way beyond tithing. If you put Robert Morris name in ch 5 when "Robert Morris" (Peter) said "you have lied to the Holy Ghost and didn't give what you said" and the man and his wife both died. I have no doubt you would be screaming "cult leader!". Rather then using the bible to attack, why not disprove the use of the scriptures Robert uses? Can your god not speak for himself? It's the bible that says you are cursed not Robert Morris. He didn't write that God did. You aren't rejecting Robert Morris. You are rejecting scripture. Try proving that God didn't say Malachi chapter 3. Prove that God has rescinded the whole of the Old Testament? There is no point to attacking a preacher if his teaching is not biblical. The truth is you just don't like what you hear. The religious killed Jesus for the very same reason. They had nothing on Jesus other than they didn't like what he said. Truth is that most American Christians (I am American by birth and parentage for several generations) trust in money, not on God. If they lost all their money tomorrow they would not be in church the following Weekend. When you learn to live by faith, you realize that, comparatively, living without it is a curse. Tithing before you do anything else is the epitome of faith because you have to rely on God for the rest. That is why this teaching is so anathema to atheist-Christians. robert preaches the truth........ its up to each person to have a relationship with god. Its not so much about the pastor. Even if he was wrong at times he is only human. Anonymous, you must not know your Bible. Since Jesus came, we no longer go by OT laws. That is why he came, the law was so strict, no one could follow. Tithing is biblical, but not food tithes. We owe the first 10% of our income to the Lord. As far as Russ Morris preaching that all monies you earn and your family, etc will be cursed if you don't tithe the first 10%, is bull. I have never heard him say that. Also, he and his wife have given away everything they own more than once. That includes his 401k, home, cars, EVERYTHING, he only asks that you give what the Lord tells you to give, but be obedient to the Lord's voice, which he and his wife have done numerous times!